HA NOI (VNS) — Medical waste can be a serious health threat if not treated properly, but few Vietnamese hospitals have invested in the process. 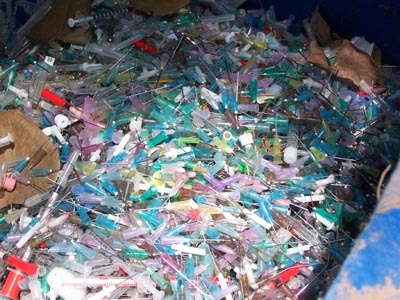 Statistics from the Ministry of Health Environment Management Agency reveal that the 1,300 or so State-run and private hospitals discharge more than 380 tonnes of medical waste a day - 40 tonnes of it considered harmful. However, nearly half of the hospitals had storehouses to hold medical waste until it was treated - or otherwise disposed of. Again, only 50 per cent properly classified different kinds of waste. This means that they mix medical waste for recycling together with harmful waste that has to be burnt. Nguyen Phuong Le, a former patient at several hospitals who lives in Ha Noi's Ba Dinh District, said that classifying medical waste was often not done properly. "Many patients and their families throw out household waste with medical waste although they have been warned against it by doctors and nurses," said Le. Director of the Health Environment Management Agency, Nguyen Huy Nga, said most hospitals did not have enough funds to buy bags to store medical waste and that medical workers were not given proper training. Nga admitted that the existing technology in Viet Nam for disposing of medical waste was backward. He said the general way was using incinerators, but few hospitals had modern equipment that did not interfere with the environment. The incinerators at most hospitals was old and of small or medium capacity. This meant it could not control harmful fumes, including dioxins. While waste water also needs to be treated, An Giang General Hospital's plant was built in 2000 and has already been downgraded. Chau Thanh District Hospital in An Giang Province did not even have equipment to treat waste. Nga said that funds were generated from hospital fees for treating waste but there were no funds for setting up disposal systems. "If a provincial hospital sets up a waste treating system using Vietnamese technology it needs billions of dong, and even much more if it uses international technology," Nga said. Hospital funds for treating medical waste often amount to only VND1 million (US$47) per year per sick bed, but this must also be used to pay for hiring workers, buying incinerators and maintainence. Nga said another problem was that many hospitals lacked professional manpower to operate treating equipment. "Some hospitals assign administrative workers, guards and doctors to operate the equipment," he said. "Others have modern equipment, but they do not use it because they do not have the trained staff to operate it." Hoang Duong Tung, deputy director of the Ministry of Natural Resources and Environment's Environment Department, also criticised a shortage of policies and guidance documents for the waste problem. Some documents were issued, but were not implemented well, or were not based on reality, he said. Two years ago, Prime Minister Nguyen Tan Dung approved a project to treat all medical waste by the end of 2020. At the start of last year, he approved another project to treat all solid medical waste by 2025. Nga said the health ministry would now issue a circular outlining regulations for treating all medical waste.